For a dear friend of mine who loves this as much as I do. This paper is an excerpt from the original work known as Liminal Cosmogony , a body of teachings employed by the Lyricus Teaching Order. These teachings are the carefully chosen words and energetic transfers of Lyricus teachers, who have expressed them from an ancient, yet distinctly relevant voice. They are colored in our language and culture not because they are texts composed for our specific species or planet, but because all planets and their inhabitants evolve in a similar ascendant path through transformative shifts to higher light and intelligence. Earth is passing through one of these corridors of higher dimensional light energy right now, and many of you are aware of this. This is part of your awakening and activation: to know that the earth is on an ascendant path, that this path includes you in a purposeful relationship, and that these new energies will restructure and realign the culture of humanity in profound and positive ways. One of these ways is a new intensity and focus of collective intelligence and empowerment.It is a goal of Lyricus to provide frameworks in which students of its works can empower themselves to be agents of spiritual awakening, align to the earth's ascendancy, and assist earth and the beings upon her in this dimensional transition. True to the standards of Lyricus. Liminal Cosmogony is not concerned with the cosmological ordering of the multiverse or the physics of time and space as they unravel in the void. The teachers of Lyricus are more concerned with the delicate human connection between the soul and the human instrument, and how this integration can be activated and its activation sustained amid third and fourth dimensional emotional turmoil, misinformation, mental static, and spurious electromagnetic fields , to name a few. Last edited by Shayalana on Wed Mar 30, 2011 11:40 pm, edited 4 times in total. This telepathic communication can only happen when one has surrendered everything of the HMS to the Energetic Heart and trust that the Energetic Heart can guide them. When one is empty of all past debris and needs of an altered ego to remain in control , they can be clear conduits of the new energies coming to the planet and the communication through telepathy coming from Teachers of the Central Sun. I find this immensely exciting if not joyful. Last edited by Shayalana on Mon Apr 05, 2010 5:07 pm, edited 1 time in total. Liminal Cosmogony is divided into seven sections. The excerpt provided in this offering is from the section entitled: "Teachers of Light." It's knowledge is condensed into a mere 120 pages, focused on the techniques and behaviors of the sustainable spiritual perspective of a teacher of light embodied in a human instrument. It is designed to create in empowerment in the student who studies it and applies its techniques and nuanced behavioral expressions. It is not for sale, nor is it freely distributed. It is given out in prescribed measures over time, and this offering-the Rising Heart-is the first. I have released the mythology of the Wingmakers as an initial stage of preparation for these higher dimensional works contained in Liminal Cosmogony. i have also provided the Lyricus website as the initial introduction to the voice of the Lyricus teachers and our instructional approach. More recently I have offered the Event Temples which will evolve into a foundation for quantum communities that will ultimately empower the teachers of light to orchestrate energetic transfers to the planet and its inhabitants (physical and non-physical alike). These are among the efforts of thousands of others who are also bringing the tools, techniques and technologies to empower individuals, and this offering is not meant to displace any of these, but rather to augment and support. The teachers of light are without affiliation to anything other than the higher light of the fifth dimensional field of unity. They are not beholden to any one system of belief , as they are collectively the system of knowledge in which they are rooted. The release of the more esoteric knowledge in Liminal Cosmogony signals a shift in the Lyricus Teaching Order to bring forward its technologies of inner light development for those who incarnated to be teachers of light upon earth. The Rising Heart will resonate with those who are prepared-who are already in the process of shifting their core consciousness to their heart's crown and operating with internal coherence. My suggestion to you is to read and reread this paper several times before you make any judgment as to its usefulness or application in your spiritual life. Then, use your intuition to guide your interpretation of the technique. The techniques of Lyricus are never spelled out in burnished detail; its teachers prefer to provide paradigms, concepts, and frameworks, leaving the precise implementation or blueprint to the individual. It is the singular initiation. I love how open and allowing this is for one to feel what is best for them in doing it according to simple guide lines not ever set in stone. Last edited by Shayalana on Mon Apr 05, 2010 5:08 pm, edited 1 time in total. The light body is awakening in literally millions of people on earth. As this blossoming of light occurs on the planet, there is an intuitive wisdom required to direct or channel this light or field of higher frequency energy. A higher ratio of light is not required, but rather a higher intelligence of light and love being applied to the right issues or problems that humanity faces. The light body reveals one's inner light and wisdom. It is the vehicle of creativity that telepathically listens to the family of light, adding dimension and nuance that deepens our interconnection and collective wisdom. The Rising Heart is a technique to help children of light to transition into teachers of light through their presence and behaviors, not because they can cite the esoteric nature of the human condition, articulate cosmological structures, or write the master keys of life. When you are drawn to this teaching you will feel a familiar resonance with the energetic frequencies contained in the words: "Rising Heart" and "Heart's Crown", as these are encoded words within your deepest being. The teachings of Liminal Cosmogony are encoded to integrate and align the harmonics of your light body with the time-space quanta of your human instrument. They weave the soul and mind-heart-body triad in temporal union so you can transmit a new understanding of your purpose as a teacher of light. If you choose to embark on this journey, do so with a sober intent and humble outlook, for you are entering a scalable relationship with the Divine being that is your light body, and calling for its highest purpose to be invoked upon this planet of five kingdoms. you are entering an accelerated path of change, as this is what higher light energy brings: accelerated change begetting behaviors befitting a teacher of light. This section of Liminal Cosmogony, known as Teachers of Light, constitutes a curriculum of the light body. It is an owner's manual for those who are embodies and desire to exercise their divine rights as a teacher of light; to share the mysterious gift of the higher light and intelligence of divine love to the planet and all upon her. Remember the writing is not so much contained in the words, but the feeling you receive from them as you contemplate their deeper meanings. May the initiatory coding of this paper awaken you to the next level of your journey. I love , "a higher intelligence of light and love." This nuance of intelligence describing light and love brings more depth and meaning to what is offered here in a greater understanding. Last edited by Shayalana on Mon Apr 05, 2010 5:10 pm, edited 2 times in total. The light body is a particle of the Divine Mind, cast from the Central Sun into and through the fourth and fifth dimensional matrices in order to embody within a human being the essence of the Central Sun. The light body's materialization begins from the seventh dimension, cascading into materiality where it settles into the first manifested being-the human heart. Within the human instrument, it is the heart that is originally the nulceus home of the light body, but eventually the light body's locus drifts upward to the pineal gland at the base of the brain, usually in the first seven years of life. Here it typically remains until the physical body expires, at which time it recirculates within the higher light realms of the fifth dimension wherein unity and the connective field of pure love radiates unimpeded by matter. This is the ground of soul where all beings flow in the vibrant river of sound and light. 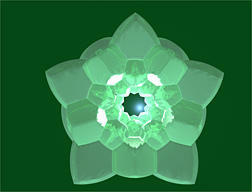 The light body is the core of consciousness, and this interior core is shifting. In your world it is shifting back to your heart, but its nucleus-home is now between the heart and throat, known as the thymus, or the "heart"s crown". We will speak of it as the Rising Heart. The Rising Heart is located on two axis or fields of vibration: the first is the horizontal axis, which is the Field of Planets. The second is the vertical axis, which is the Field of the Central Sun. On the planetary axis, there is the material being or human instrument, composed of the sheaths that protect and sustain the light body-physical, emotional, and mental sheaths of the third and fourth dimensional matrix. This axis represents the planet meeting your light body. It is the axis of grounding and anchoring the light body to the planet and the physical beings upon her. The light body is the zygote of consciousness formed by the union of divine light and sound. It is born radiant, pure, intelligent and life-sustaining. The light body listens to both your thought-scape and feeling-scape, adjusting its radiance in accordance to its perceptions. Thus, the light body reacts to the lower dimensional matrix, and in this way is influenced by the individual's level of coherence, intelligent expression, creative insight, and higher mind intuition. As the core of consciousness shifts to the new axis of the Rising Heart, the internal coherence of the individual becomes the amplifier of the light body's radiance in the world of form. This internal coherence is heightened when the thought-scape and feeling-scape of the individual are aligned and flowing in the river of divine will. It is then that the light body can truly step forward and radiate its purpose on the planetary level. Last edited by Shayalana on Mon Apr 05, 2010 5:11 pm, edited 2 times in total. As the children of light begin to activate their light bodies while living within a human instrument, they will sense the presence of their electromagnetic field as it becomes enmeshed with their every breath. The breath washes over the Rising Heart in both the in-breath and the out-breath. When breathing in, the energy symbolically descends from the Central Sun and flows through the crown chakra settling at the solar plexus just below the heart. There, it sparkles in the golden light of your signature tone. When breathing out, the energy is released from the solar plexus up to the planetary axis at the height of the thymus or Rising Heart, and then radiates outward with dominance to the horizontal plane. In this time of the Grand Awakening the light body is becoming centered at the Rising Heart because the mind-where it has been centerd for thousands of years -is enmeshed in static and distortions that confound the light body's ability to fully radiate its energetic field upon the planetary grid and fulfill its purpose.The intersection of the two axes (Planetary and Central Sun) is the activation point of the individual. The integration of breath and imagination is the most efficient method through which this activation can occur and be sustained within the human instrument. The breath of the Rising Heart is the practice of breathing from the Central Sun and expressing this breath energy into the planetary grid. It is the method of activation taught on all planets for those aligned with the Plan of Expansion into the Lands Unknown. When you read these words you will understand intuitively for you know well the mysterious purpose that stirs you awake and compels you to action. Last edited by Shayalana on Mon Apr 05, 2010 6:15 pm, edited 3 times in total. Last edited by Shayalana on Mon Apr 05, 2010 5:58 pm, edited 3 times in total. The breath of the soul is directed by the light body whose seat of intelligence resides at the point of the Rising Heart. You can imagine this as a portal within the body that receives the electromagnetic field of light from the Central Sun through the in-breath, and directs it to the solar plexus; channels it across the planetary axis as a way of grounding the energy within the field of third dimensional beings. This is a time of action, and the action is to activate your light body to its purposeful role within your human instrument, and to share its higher frequencies to the human emotional field. This activity re-grids the collective heart and connective mind to the emerging culture of the one, unified planet moving in the upward spiral of the seven dimensional hypersphere in which all beings within its quantum and space-time presence are unified with the planet, and the planet with the Central Sun. In this future time, beings will be galactic citizens and they will commune with other inter-galactic citizens and see the universe as they now see the planet. Each of you who embody the light of the Central Sun, and not only carry it with you, but purposefully radiate it through your actions of intelligent love and the virtuous heart, you are builders of this future time, and your actions will be acknowledged with its direct experience. When the breath of soul radiates outward on the planetary axis of the individual, it takes on the signature field of that individual. This signature is like a "carrier wave" to the original signal from the Central Sun, and it is this carrier wave that is the key factor that enables the rays of the Central Sun to cut-through the static and distortions of the planet's electromagnetic fields. Last edited by Shayalana on Mon Apr 05, 2010 5:13 pm, edited 2 times in total. There are many competing currents and conflicts within the planetary realm before its entrance into the higher dimensions of the etheric plane. These currents pull you, and push you, and deliver you to shores of indeterminacy and questionable value. There are light bodies cast in human instruments that are so darkened that they are like black holes in space, swallowing light in the gravity of their misguided ignorance. The light body is, in some ways, a fragile consciousness. It listens well and responds to what it hears. It sees the higher realities, but it also dives deep into the lowest realms seeking out the unique separation veils that empower its discernment,which ultimately reinstate its power as a sovereign integral of the highest order. The life of the light body is complex-more complex than you can imagine and yet you can appreciate its goals and the journey it weaves to achieve them because your intuition and imagination enable you to feel the edges of its reality. Those who are the Builders of the Grand Expansion are embodied in human instruments and they are awakening to their light bodies as their light bodies begin to activate to the new rays of light and love that are flowing from the Central Sun. There are saviors and messiahs that enter the planetary grid in its third dimensional and fourth dimensional state to periodically re-align the spiritual teachings of humanity to their Ancient Source. However, now is the time when the Teachers of Light are operating as a collective power, joining together to weave a new fabric of time, space and energy-one that is ultimately the portal to the fifth dimension. The Planetary Teachers are generally embodied, while the Central Sun Teachers are mostly operating in their light bodies on higher dimensions, and in some cases, other galaxies. The Planetary Teachers of Light require activation, internal coherence, a balanced flow and outflow of love and light through a virtuous and heart-filled behavioral system, and the quiet of re-connection time to rejuvenate and rebalance their human instrument. Last edited by Shayalana on Mon Apr 05, 2010 5:14 pm, edited 2 times in total. The Rising Heart is a system to achieve each of these requirements. It is not the only way; it is a proven way. It is a framework that can be adapted and modified to suit an individual's preferences of imagination and intuition. The teachers of light are quantum beings of great power. Though they wear human instruments of density and distortion, they never lose sight of their rightful purpose and the ultimate ascendancy of their family of light. The human instrument is a fabric of frustration for the teachers of light, as they know well what they are, but like a ballet dancer wearing a spacesuit, they are not able to express the fullness of their higher wisdom in the material worlds. This frustration is coupled to the third dimension construct that teachers must teach through words-spoken or written-yet we tell you that it is through your behavioral system, the expression of your virtuous heart and the application of techniques like the Rising Heart that define you as a teacher of light. The writings of the Planetary Teachers are telepathically transmitted by the Central Sun Teachers, who in turn translate the energetics of the Central Sun and step-down these higher energies into the vocabulary of the human family. This is the system of dispensation that prevails on all planets until the species achieves equilibrium, at which time, the communication from the Central Sun is direct and immediate. The central Sun, in essence, is opening the channels of telepathic communication to the teachers of light so they are able to transmit the vibratory energies to the general masses entrenched in the energetic quagmire of the previous and current dimensions. As planets ascend inter-dimensionally they require a higher connection to the Central Sun to draw them from their present dimensional grid into the next level, and this is precisely what the Central Sun Teachers instruct the Planetary Teachers to do: to facilitate this higher connection through various techniques that activate the light body of the teachers of light so they may collectively create the higher connection. If you will inhale the light of the Central Sun, and take it into your soul's workshop, adding your fingerprint of love for your brothers and sisters, and then release this higher light to them and your planet, you are creating this higher connection in this simple act. Not only for yourself, but for all. All of the human family benefits for we all rise on the same currents of divine love and the higher intelligence that prevades it. The teachers of light have the opportunity to re-energize their association of the breath and the heartbeat and feel their rhythmic energy as the connection to life and the higher, universal intelligence that flows from the Grand Central Sun. In doing this, you bring yourself in alignment to the Grand Awakening, as the higher truths are being downloaded to your world. Your human family-living between the forces of light and dark-will awaken to the multidimensional world and leave the fields of illusion behind, never to return. Hey star, this paper is a virtual masterpiece and with practice, our hook up to our multidimensional galactic kin for real. Love'n it Shay ... can't get enough of the Liminal Cosmogony (even if I can't spell it ) ... it is so "pure" and so embedded ... go glad to see it here again in the forum ... thanks for all the work you did putting this together, I know that particular paper doesn't allow you to c and p and that you had to transcribe the whole thing, and I am grateful, because if I ever want to c and p it now, you have left me a link (why I posted the pics too ) I hope everyone can appreciate this work, and you certainly have my gratitude. I forgot about your lightbody thread in 2008 and perused it and realize how fabulous the research and great for an understanding of the Rising Heart paper....again...and then there's the "galactic" aspect which could very well be related to what we have been doing with orbs, cool huh?. I also appreciate you bringing this wonderful work to the forefront....It is so inspiring! Shay,you have repeated a quote several times over. I am not a educated person,nor do I understand the terminology. 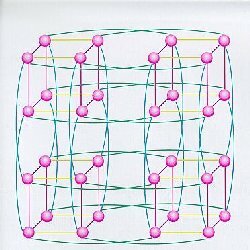 Can you please explain what the seven dimensional Hyperspheres are? Thank You. hyperspheres of unit radius which are tightly-packed so that two adjacent hyperspheres touch each other. This is a hypersphere graphic with 5 attributes which would equate to dimensions otherwise. You can see groceries, health, transportation and housing as the 4 vertical attributes and utilities as the horizontal. Each would represent a dimension and they all touch each other. Each is a radius of the sphere. In the above hyperspheres there are many radius' also which would equate to different dimensions. Figure 2. The blue sphere touches each of the eight identical grey spheres. Glean from this what you can I'm sure you will get a feel of it. Interesting too would be to see the tributary zone floor with all of its spheres as a hyper sphere. Imagine if you will what that could look like in 3-D, 4-D, 5-D, 6-D, 7-D. Just get a feel here and reread the excerpt until you actually get a feel of it. It worked for me. I hope this helps. "2D-projection of 3D-projection of Hypersphere of 4D-space"
"© 2006 by Me / Dual-licensed under the GFDL and CC-By-SA-2.5, 2.0, and 1.0"
There's lots to be found on the internet on the subject of higher-dimensional spheres. There are all kinds of wonderful sites of any level of mathematical detail that you could care to read. And this one is mine. Here I attempt to document a particular bit of noodling I did on the subject once. There are diagrams and pictures that should go along with it, which maybe I'll get around to drawing or otherwise creating. In particular, I tried to reconcile to myself two descriptions I'd used/heard in proofs and discussions regarding hyperspheres. One (I think from Ian Stewart's Flatterland) involves picturing successive 3-D slices as spheres of varying color: the fourth dimension runs from blue to red (through purple), and as we shift our slice-plane in one direction, the big purple sphere gets smaller and bluer, and going back the other way it grows back to its full purple size and then keeps getting redder as it shrinks again toward its center. Work with this one a second. Big purple sphere sitting in the middle of the room. We have our little cage that slides back and forth along the fourth dimension (traditional terms for directions along the fourth dimension include “ana” and “kata”, etc. But I'll probably mostly stick with red and blue in this discussion, since that's easier to picture, and picturing is the whole point of this page). Press one pedal, and we see slices more towards blue, which are of course smaller (as you approach the extremities of any dimension, the sphere gets smaller of course) and bluer, until it's just a little blue dot at the center of what was the big sphere. Press the other pedal, and the blue dot grows and gets redder, becomes the big sphere at midway purple, and then gets smaller but redder. Remember that all the points on all these variously-colored spheres are present at the same time; the sequential presentation is just an illusion caused by looking at them slice by slice. So you can imagine the non-purple points to fill the whole space inside the purple sphere; every 3-dimensional point is the projection of two 4-dimensional points on the hypersphere, one on the blue side and one on the red side—but they're still all on the surface of the hypersphere. A word on terminology. Although it might seem obvious that we should refer to the four-dimensional sphere as a “4-sphere” and to the three-dimensional one as a “3-sphere”, in fact it isn't that simple. Some mathematicians do use that terminology, but many, especially topologists, whose field is very intimately concerned with these sorts of shapes, have a different modeling. Topologists are concerned mostly with the surfaces of things, as the name implies. Since the surface of a 3-dimensional sphere is a 2-dimensional space (it's like a plane curved around the sphere, you see), the surface of the 3D sphere is called a “2-sphere”, or S2. So too, the surface of a 4D sphere is a “3-sphere” or S3 and so on. The inside of the 3D sphere itself (not its surface) is called a “3-ball” or B3 and so forth. Sn-1 is the surface of Bn. Isn't math fun? OK. Now for the other view of the hypersphere that I heard. This came from a lecture I heard on an application of the Fixed-Point Theorem, namely the so-called Hairy Ball Theorem. Imagine a fuzzy sphere; each point on the sphere has a little tiny hair growing out of it (these are imaginary, differential hairs, okay? They're simple one-dimensional line segments of arbitrarily short length, coming out of every single point). You need to comb all those hairs flat, in some continuous fashion without abrupt changes of direction. You can't have abrupt changes of direction, since after all there's a hair on every point and there'll be points along the boundary of your change that won't know what to do. If you think about it, you can't do it. You can't comb all the hairs down neatly. You can try going 'round and 'round in circles around the lines of latitude—but then what will happen at the poles? Same problem if you try combing everything toward one pole. This implies, by the way, that there has to somewhere on Earth where the wind isn't blowing. It also means that every reasonably full, freely flowing head of hair has to have a cowlick, where the hair spirals out. Now try doing the same task with the surface of a 2-dimensional "ball", i.e. a circle. A fuzzy circle can easily have its hairs all combed down: just comb them all around it clockwise (or counterclockwise). As the Mathworld link above will tell you, it turns out this is possible whenever the number of dimensions is odd, but not when it's even. (Remember, the ordinary 3-dimensional case counts as even, because we're dealing with the 2-sphere S2, and the 2D circle is odd because it's S1. Those wacky topologists.) So you can comb down the hairs of a fuzzy 4D hypersphere (which is good to know if you ever get a job as a barber in four dimensions). And that theorem is what the lecture I attended was about. The lecturer actually proved the general case, for all n, and when giving the background and bringing up the 4D case as an example, he quickly explained it was possible, since after all, a 4D hypersphere is equivalent to two circles: one in the east/west × north/south plane, and one in the up/down × blue/red plane, and you can comb each circle around like we said before. And that makes sense, sort of... but how does it jibe with the multicolored sphere from the other model? Specifically, what do these two circles look like on the multicolored sphere? That's what I'm trying to reconcile here. Well! You've read probably something over a solid page of text (depending on your browser), more than many web pages ever have all together... and you've managed to make it past the introduction, ready to get to the actual description. Is it too late to warn you that I'm long-winded? So let's consider where these circles are. It isn't just two circles, obviously. It's two families of circles, one of each of which intersect at every point on the hypersphere. That is, through each point on the hypersphere (the surface, remember), passes one horizontal circle and one vertical/chromatic circle (that's what I'm going to call the fourth direction, since I'm representing it by color). Naturally, they don't have to be horizontal and vertical and whatever, presumably they can be any orthogonal directions, but without loss of generality this is how I'm lining them up for the sake of discussion. The horizontal circles we can imagine easily enough. They go around the sphere like lines of latitude. Each such circle has a fixed vertical position and a fixed color, or to look at it another way, these circles live horizontally, in stacks of growing and shrinking radius, on each of the 3-dimensional spheres of various colors that make up the hypersphere's slices. (Yes, they also stack up chromatically at each fixed vertical position, but we're building up to understanding that; we don't need to work with it yet). What about the vertical/chromatic circles? Each one lives along a vertical line segment inside the large purple 3D sphere, when looked at in only 3 dimensions. It starts at the top, at the intersection of the largest 3d sphere (which we should probably call a Great Sphere, like a great circle is a slice of a sphere which contains its center) with the vertical line we're looking at. 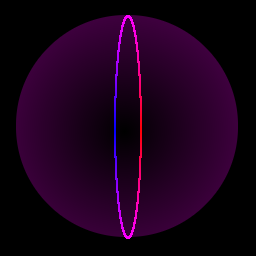 That is in perfect midpoint purple, then proceeds vertically downward, into the sphere (it looks that way, of course, but it's still on the outside of the hypersphere) becoming redder and redder until it reaches its reddest point just where it crosses the vertical midline. There's a picture to the right; I've artificially expanded the circle to make it a narrow ellipse in the two dimensions I'm drawing, but really it's a one-dimensional vertical line if you don't count the color dimension. So its color changes fastest at the top and at the bottom, where it's perfectly purple—that is, when it crosses the midplane of the chromatic axis (which is at the extrema of its vertical movement), it is at a high angle, in fact it is perpendicular to the plane at that point. The color-change is the slowest when it reverses direction, at its red and blue extremes. Note that it won't get fully red or blue (i.e. as red/blue as the hypersphere gets) except at the great circle which goes through the center of the sphere. That's all perfectly okay and sensible. Note that we don't have to think about what the circles do in the “other” spheres, the redder and bluer ones. The circles span the chromatic dimension, there's only one circle for each point in the horizontal plane, passing through all the points on the sphere with those horizontal coordinates, no matter the vertical or chromatic coordinates. Let's make sure we have these pictured; this is the hardest part. Take a look at the picture to the left. In order to get away from special cases, we are looking at an “off-center” circle, one that doesn't pass through the center of the sphere. That circle is represented by the vertical line in the picture. Recall that the 3D projection of the circle is just a vertical line segment. 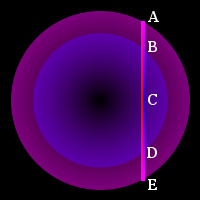 The topmost extent is at point A, which is where the circle in question intersects with the “Great Sphere”, the big purple one. From there, the circle descends vertically, going downward and blue-ward (shown here on the right side of the vertical line). I've drawn another sphere in for reference. It's one of the smaller spheres on the blue side of purple. When the circle gets to the right shade of blue, it is at point B, where it intersects with the smaller circle, at the same height and the same blueness. There are lots of other spheres it does the same thing with; I'm just showing one as an example. The point we're imagining going around the circle is sliding downward and blue-ward, always riding on the surface of the hypersphere, always riding on the surface of the appropriately-colored 3d sphere. It reaches its maximum blueness at point C, where it crosses the midline. Note that its maximum blueness is not the same as the bluest extent of the sphere! The sphere reaches its very most blue, its blue pole, at the center of the Great Sphere (in 3D; obviously it's farther away in the blue direction). The bluest our circle gets is the color of the smallest blue sphere that touches that line, the sphere which would be tangent to it if it were just a line. After point C, it reverses chromatic direction and starts getting redder as it goes downward. At the right shade, it again touches our bluish sphere, at point D, still becoming redder (and getting faster at getting redder) until it reaches perfect midpoint purple at point E, its lowest vertical point. There, it reverses vertical direction—but not chromatic direction—and heads back upward, still getting redder, now on the red side of purple (I'm showing that here on the left side of the line). Back at point D, it now does not intersect the bluish sphere, because it's now on the redder side, so it's passing through an identically-sized reddish sphere. It reaches maximum redness back at point C, where it was also maximally blue. Note that the circle never actually intersects or touches itself (how can it? Circles can't intersect themselves and remain circles). It seems to occupy the same point twice when projected into three dimensions, but each time it's a different color, i.e. at a different location in the chromatic direction. From point C again, it continues on up, getting bluer now as it's reached maximum redness, getting to point B when it's as red as it was blue when it passed through it the first time. (Read that again, it makes sense.) Eventually it gets red enough to be at midpoint purple again, just where we started back at point A. Whew. Did that help? And the hairs on those circles? That's what we need to look at. Once we have those, we can say we're done, because the hair-combing on the hypersphere as a whole will be the vector sum of the horizontal hair and the vertical/chromatic hair that come from each point. The hairs on these circles, of course, point in a combination of up/down and red/blue directions. Imagine a particle sliding along the circle; its direction at any instant is where the hair points. Note that just where the up/down motion is slowest, at the top and bottom where it changes over from going up to down and vice-versa, the red/blue motion is the fastest (see the above diagram again). At those points, it's speeding steadily from red to blue (or the other way). Conversely, when it's at its extrema of red/blue, turning around to go the other direction at the vertical midpoint, the vertical motion is fastest. So we can see how the hairs comb around it. OK! Now at each point we have a hair in the horizontal direction (from the horizontal circle passing through the point) and a hair in the vertical/chromatic direction (from the vertical/chromatic circle). We can add those together as a vector sum to get one combined hair. But lengths don't really matter, and the two hairs are at right angles to each other, so the direction of the “combined hair” is just the direction of the angle bisector of the angle between the two hairs. Yes, it makes sense to talk of an angle here. One hair is pointing, say, at a slope of 3 units east per 2 units north (i.e. measuring the angle from the eastern axis, tan θ=2/3). The other is point, for the sake of argument, at a slope of 1 unit upward per 2 units blue-ward, so tan φ=2, measuring angles from the upward axis). Add those two angles together. Imagine taking something pointing at angle θ in the horizontal plane and rotating it up-and-blueward by φ. It doesn't matter if you can't really mentally do the math, so long as you can conceive that it's possible to do that, and thus combine the two combings into one continuous combing of fuzz all around the hypersphere. Just to stick a fork in this thing for good, let's take a look at some edge cases. If anything is going to go wrong, we'd expect it to happen at the poles, right? Where the ends of the axes poke through the hypersphere. That's where it fell apart for us when we tried our tonsorial talents on the 3d sphere: we could comb around, but the top and bottom poles were the problem. So, let's look at the ends of the axes. There are eight of them, but without loss of generality we'll just look at the positive halves, so that's only four. Two of those are pretty simple. The east and north axes poke out of the hypersphere on the Great Sphere (the purple one) along its equator around its middle. Argh, terminology is confusing things again. North and East refer to the room that the sphere is in, not to directions on the sphere like on a globe. Keep that in mind. OK, so those poles are on the equator of the purple sphere. At those points, the hairs are pointing straight sideways, across the axis (i.e. at the east pole, the hair points due north or south, depending on how you combed the hairs: the north/south dimension doesn't contribute, and neither do the other two). The hair doesn't really point up or down or blue or red at those points, because we're at the limiting cases for those. A little way in from the pole, we have teeny tiny circles that get smaller and smaller until we get to the pole. The extent of the hypersphere in the vertical and chromatic direction vanishes at the pole, so it makes no contribution. Those contributions were getting smaller and smaller as we approached the pole anyway, so it's continuous. Now let's see the upward pole, the very top of the sphere. Here we have the opposite situation: the two horizontal contributions go to zero because the circle gets vanishingly small, and the vertical contribution is also zero because this is just where that vertical circle is switching over from going up to going down, so it's not pointing up or down either. But it's at its maximum in the chromatic direction: there's a hair pointing due red (or blue). And don't forget to look at the blue pole. That's located in the center of the sphere in 3-space, but all the way on the blue end. The horizontal contributions are still zero, because the sphere has become minimally small and it doesn't have extent in those directions. Its chromatic direction is also zero because the circle that passes through here is just switching over from heading blue-ward to heading red-ward. Remember, this is the blue-most peak of the hypersphere. But the vertical contribution is at its strongest. Travelling in the vertical direction, this is right where the sphere is about to explode outward as fast as it ever does (or it's just finished exploding inward, depending on how you look at it). There's a hair there pointing straight up (or down), and all other contributions approach zero as we approach that point. Whew. Well, I think we've taken this about as far as we can for now, and if you really ponder it more, the hypersphere starts making more sense. You can start to imagine, for example, skew circles, that don't lie in any plane parallel to the axes, so they have extents in all four dimensions. Maybe work on how a torus looks painted on the surface looks (I think there's an xscreensaver mode called hypertorus that shows a torus on a rotating hypersphere. See if you can make sense out of what it shows). Did this site help you at all? Let me know. Colorful, flexible seven-fold model of the evolving universe. The torus, or donut shape, is the latest physicists' conception of the shape of the universe. This same mathematical form occurs everywhere in the natural world, from electromagnetic fields to galaxies, from atoms to apples. The seven-fold principle, which can be found throughout the world of science, art, myth and music, is built into the HYPERSPHERE. Why is the HYPERSPHERE shaped like a donut? Today, cosmologists say that the universe of relativity and quantum physics can best be understood when seen as a torus, or donut shape. A universe containing black holes, white holes and "wormholes" conforms best to this model. And a torus has the same formula (2pi2r3) as the HYPERSPHERE. As a model of the universe, the HYPERSPHERE shows how things emerge in time and are enfolded back into fabric of the universe. You can experience this by rotating your HYPERSPHERE through its center. Where does the HYPERSPHERE occur in nature? Almost everywhere! The vortex, which is a section of the torus, occurs throughout the natural world-from tornados, whirlpools and electromagnetic fields to the formation of galaxies. And the torus shape is not limited to vortices. An apple, a tree, even a human being all share this same "toroidal" topology. Why does the HYPERSPHERE have seven colors? On a torus, it's possible to create a map that requires seven colors, and this is what we have done. If you look closely at the HYPERSPHERE, you will see that every color is touching every other color. Why is the seven-ness of the HYPERSPHERE significant? Since the HYPERSPHERE is a model of the universe, we can say that seven-ness is a basic feature of the natural world. We know this innately. This is why the seven note musical scale is naturally harmonious; why we have seven days in our week; why there are seven colors in the rainbow. Our myths and legends are full of stories where seven is the most important number, representing the completion of a mystical journey or mythical task. And this is no accident. *The formula for the volume of a regular sphere is 4/3pi(r3)The formula for a HYPERSPHERE is 2pi2r3. The extra pi in the HYPERSPHERE formula represents rotation in an additional dimension. It's truly amazing how powerful feeling with ones imagination is . It certainly works well with some of the HeartMath techniques where in but a moment your perspective changes simply because you have shifted out of incoherence into coherence. It's what emotional maturity is about and the benefits for a body alleviated of the stress which incoherence brings. Perfectly done with the Rising Heart. ...The teachers of light are without affiliation to anything other than the higher light of the fifth dimensional field of unity. They are not beholden to any one system of belief , as they are collectively the system of knowledge in which they are rooted. So simple to do and really requires little time to do it in many times a day. ...The teachers of Lyricus are more concerned with the delicate human connection between the soul and the human instrument, and how this integration can be activated and its activation sustained amid third and fourth dimensional emotional turmoil, misinformation, mental static, and spurious electromagnetic fields , to name a few. What I really love about Lyricus is that the 6 Heart Virtues are our saving grace to be able to sustain ourselves over time in doing such things as the Rising Heart and overlayering and transmuting everything that interferes and distracts with that process. Over time with doing the RH one becomes it to such a degree and so much is transmuted and so much changed and given to others that before you know it we are on par with the transformed Earth and living in that which we think is only a dream now. That's because we still have much work to do in transmuting the HMS... together.